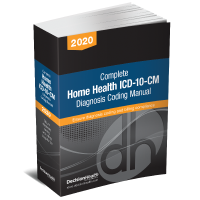 DecisionHealth’s Home Health ICD-10-CM Coding Companion, 2019 is the perfect educational resource to use in conjunction with your 2019 Complete Home Health ICD-10-CM Diagnosis Coding Manual. 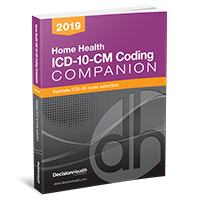 DecisionHealth’s Home Health ICD-10-CM Coding Companion, 2019 is the perfect educational resource to use in conjunction with your 2019 Complete Home Health ICD-10-CM Diagnosis Coding Manual. It's your guide to accurate coding and compliance with expert guidance and comprehensive decision trees to help you navigate the ICD-10 code set. Bonus: Disease-specific coding decision trees, including ones for coding diabetes and its manifestations, wounds, anemia, neoplasms, CVA and late effects, COPD and more. Enhance your ICD-10 coding knowledge, validate your coding decisions and ensure proper payment for services delivered with the Home Health ICD-10-CM Coding Companion, 2019, the perfect companion to your Home Health ICD-10-CM Diagnosis Coding Manual.